You can estimate the plant model programmatically at the command line or interactively using the System Identification app. This example shows how to identify a plant model at the command line. For information on identifying models using the System Identification app, see Identify Linear Models Using System Identification App (System Identification Toolbox). Load the measured input/output data. This command imports the plant input signal, u, plant output signal, y, and sample time, Ts to the MATLAB® workspace. Create an iddata object from the input and output data. You can optionally assign channel names and units for the input and output signals. Typically, you must preprocess identification I/O data before estimating a model. For this example, remove the offsets from the input and output signals by detrending the data. You can also remove offsets by creating an ssestOptions object and specifying the InputOffset and OutputOffset options. For this example, estimate a second-order, linear state-space model using the detrended data. To estimate a discrete-time model, specify the sample time as Ts. FREE form (all coefficients in A, B, C free). Use "idssdata", "getpvec", "getcov" for parameters and their uncertainties. Estimated using SSEST on time domain data "mydatad". You can use this identified plant as the internal prediction model for your MPC controller. When you do so, the controller converts the identified model to a discrete-time, state-space model. This command creates a state-space model, ss2, with two input groups, Measured and Noise, for the measured and noise inputs respectively. When you import the augmented model into your MPC controller, channels in the Noise input group are defined as unmeasured disturbances. 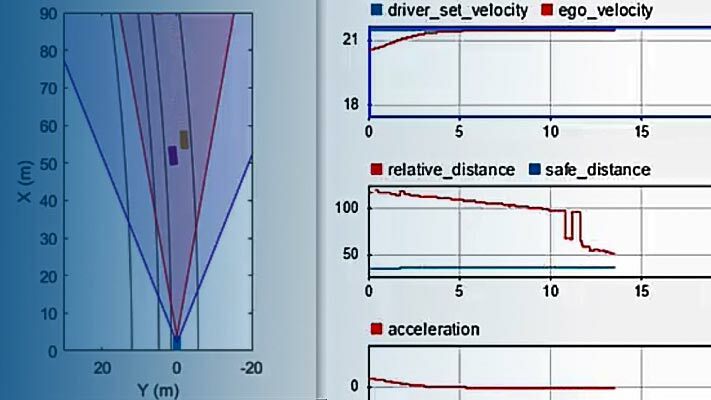 You can use System Identification Toolbox software to estimate finite step-response or finite impulse-response (FIR) plant models using measured data. Such models, also known as nonparametric models, are easy to determine from plant data ( and ) and have intuitive appeal. Use the impulseest function to estimate an FIR model from measured data. This function generates the FIR coefficients encapsulated as an idtf object; that is, a transfer function model with only numerator coefficients. impulseest is especially effective in situations where the input signal used for identification has low excitation levels. To design a model predictive controller for this plant, you can convert the identified FIR plant model to a numeric LTI model. However, this conversion usually yields a high-order plant, which can degrade the controller design. For example, the numerical precision issues with high-order plants can affect estimator design. This result is particularly an issue for MIMO systems. Estimate a low-order parametric model using a parametric estimator, such as ssest. Initially identify a nonparametric model using impulseest, and then estimate a low-order parametric model from the response of the nonparametric model. For an example, see . Initially identify a nonparametric model using impulseest, and then convert the FIR model to a state-space model using idss. You can then reduce the order of the state-space model using balred. This approach is similar to the method used by ssregest. Cutler, C., and F. Yocum, "Experience with the DMC inverse for identification," Chemical Process Control — CPC IV (Y. Arkun and W. H. Ray, eds. ), CACHE, 1991. Ricker, N. L., "The use of bias least-squares estimators for parameters in discrete-time pulse response models," Ind. Eng. Chem. Res., Vol. 27, pp. 343, 1988. Wang, L., P. Gawthrop, C. Chessari, T. Podsiadly, and A. Giles, "Indirect approach to continuous time system identification of food extruder," J. Process Control, Vol. 14, Number 6, pp. 603–615, 2004.